I have been a lawyer in California since 1978, living and working in Oakland where I own a 101-year-old house which is lovely but a lot of work. I helped to bring up a child who is now 31 living in New York, and am active in St. Mark’s Episcopal church in Berkley, studying for a Certificate of Theological Studies at the Church Divinity School of the Pacific. My travels have included China, England, France, Mexico, and New Zealand, and I hope to do more if I can ever get myself completely retired; I’ve worked three days a week for 21⁄2 years. Notes of my life: Interesting jobs with War on Poverty and Jobs Corp Center, before law school in the 70's. 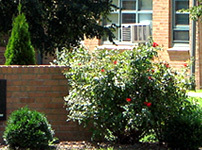 Current activities: Has been in the field of Elder Law in Oakland, California since the field emerged in the early 80's. Active in the St. Marks Episcopal Church of Berkeley. Memories from Lawrence High days: Editing the paper and helping write the class prophesies and wondering how many predictions came true. The 4th of July fireworks at KU stadium. I was an Army wife for 10 years, moving nine times in those 10 years! We lived in Taiwan for two years. I am widowed now, have two children and three grandchildren. I taught elementary school for 30 years; the last 20 were kindergarten. I crochet for groups — “Soldiers’ Angels” and “Cozees” and “Snuggles” for homeless pets. I plan to resume quilting and enjoy time with family and friends. Memories from Lawrence High Days: Band and other music classes, Mr. Wherry, Mr. Stuart, being shy, homecomings, and friends, friends, friends. James (Joe) Chaney died Saturday, April 9, 2011, at Kansas University Hospital in Kansas City, Kan.
"I got a call telling me that Joe Chaney had died yesterday from a massive heart attack. He had had a kidney transplant about 2 weeks ago and was out with his brother. He got to feeling ill and they were in the KU Med Center elevator going to see a doctor when he collapsed and died." Survivors include four brothers, a sister-in-law and several nieces and nephews. I retired three years ago after a 38-year career in banking in Overland Park, Kansas. It took a short time to adjust and now I spend my time traveling. Widowed, I have one son and three grandchildren who live in Austin, Texas. Family: Widowed 5 years ago, one son, 3 grandchildren in Austin, and Cassie Dog. Have been in banking the last 30 years and plan on retiring in 2006. Looking forward to more travel, going to Austin a lot, golf, working in my yard and house and volunteering. Notes of my life: 39 years in education: elementary teacher, principal, junior high science. Memories from Lawrence High days: Growing up in a great community and being a part of Lawrence’s winning football tradition. Knowing the coaches and other players. 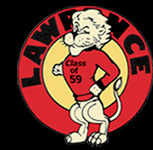 Memories from Lawrence High days: It seemed like each day meant school until 3:05, then sports, going home and doing chores, and doing it all again the next day.